Discussion in 'Burma & India' started by PackRat, Nov 9, 2018. I've been revisiting my research on the fighting at Donbaik, Arakan, in early January 1943, and particularly the incredible VC action (or actions really, should have been VC and Bar) by Parkash Singh. While Googling around I found, to my surprise, that just a few days ago Thames TV uploaded their 1985 documentary featuring an extended interview with the man himself explaining what happened. An amazing watch - see the 60+ year old Bert Causey climb into a carrier for the first time in 40 years like he was still a 20-something subaltern, and his saviour Parkash Singh vividly reenact events with help of a Bren gun! Sadly, the appendix mentioned with a report on the action has been lost (or possibly stolen) from TNA's copy of 5/8 Punjab's diary, and there also seems be a page missing from 1 Innisks' diary covering the action as there's a sudden jump between dates in an otherwise very detailed account. 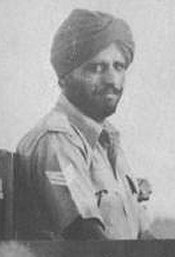 On the 6th January, 1943, at Donbaik, Mayu Peninsula, Burma, when two Carriers had been put out of action, Havildar Parkash Singh drove forward in his own Carrier and rescued the two crews under very heavy fire. At the time, the crews of the disabled Carriers had expended their ammunition and the enemy were rushing the two disabled Carriers on foot. This N.C.O.’s timely and courageous action, entirely on his own initiative, saved the lives of the crews and their weapons. On the 19th January, 1943, in the same area, three Carriers were put out of action by an enemy anti-tank gun and lay on the open beach covered by enemy anti-tank and machine-gun fire. One of these Carriers was carrying the survivors of another Carrier in addition to its own crew. Havildar Parkash Singh, on seeing what had happened, went out from a safe position in his own Carrier, and with complete disregard for his own personal safety, rescued the combined crews from one disabled Carrier, together with the weapons from the Carrier. Having brought the crews to safety, he again went out on the open beach in his Carrier, still under very heavy anti-tank and machine-gun fire and with the utmost disregard for his personal safety, dismounted and connected a towing chain on to a disabled Carrier containing two wounded men. Still under fire, he directed the towing of the disabled Carrier from under enemy fire to a place of safety. The problem with accounts of Singh's actions, and it happens even in this documentary, is that the events of the 6th and the 19th tend to get mixed up and squashed together. Does anyone have any information at all regarding, in particular, the events of the 6th? None of the war diaries of the units in the area (5/8 Punjab, 1/7 Rajputs, 1st Inniskillings, 130 Field, 8 Mountain Battery) mention anything about a carrier action on the 6th. The 19th is pretty well recorded, and occurred during Day 2 of the failed assault on the main line of Japanese defence in front of Donbaik by the Inniskillings and Rajputs. 0900 A Coy 1 INNISK tried to attack the first objective, a wooded area near the coast, from a flank but were shot at by a concealed M.G. to their rear. The carriers attempted to cooperate again from the beach by attacking the VILLAGE AREA but were heavily shelled by mortars and also by an A.Tk gun which turned out to be a captured Br 2-pr. One carrier was set on fire and two others received 3 direct hits. These two carriers were very gallantly withdrawn by HAVILDAR PARKASH SINGH 5/8 PUNJAB, who received the V.C. for this act which was carried out under heavy fire. Early in January several Inniskilling carriers advanced down the beach while we fired HE to keep the Japs’ heads down. The object was to attack from the shoreline out of sight of Jap bunkers and round the chaung, but they were heavily mortared and the Japs were preparing to rush the carriers. A Halvidar of the 8th Punjabs moved out in his carrier and rescued the crews. Two weeks later, in the same spot, five carriers were put out of action by anti-tank fire, one was in flames and the wounded were in the other two but were under heavy fire. The same Halvidar, who must have had a charmed life, went out and towed the first carrier to safety. He then returned to the other carrier. By now the sand was well churned up by mortar fire. Keeping the carriers between himself and the enemy he calmly hooked his chain and towed, several times he had to get out and shift the chain to the hook on the other corner of the carrier to pull it straight. In the loose sand and the heat it seemed to be in slow motion, but he got back safely. I saw one driver lifted out, his feet had been severed by anti-tank shells which seemed to have been fired from a British 2-pounder anti-tank gun, probably captured with ammunition during the retreat from Burma. Sadly the driver died. Smith's account of the second action (the 19th) fits in fairly well - in the documentary Bert Causey says that his driver had his legs severed by an AP round, he wasn't just shot through the thighs as 5/8 Punjab's diary reports. However, I'm from other evidence fairly sure that Smith was in 316 Battery, which didn't arrive on the scene until after the 6th of January (494 Battery was the only element of the regiment in action at that date) so he couldn't have witnessed the first rescue personally. Another veteran memoir from 130 Field - Bill McCulloch, who was with 494 Battery - states that the battery was advancing along the beach in very early January with four carriers about 500 yards ahead when the carriers came under attack. He says that the battery unlimbered and provided supporting fire while Singh performed a rescue, but there's no record of this in the regiment's diary (which is admittedly pretty sparse for early January), and nor is there a record in Nicholson's exhaustive account. McCulloch gives the date of this as 1st January, which doesn't fit with any other evidence at all. He could be mistaken and be referring to the 6th, but the battery's actions as recorded in 'official' sources still don't quite fit. Also, there had been a catastrophic friendly fire incident on the 5th which left McCulloch with shell shock and needing hospital treatment, so his recollections are puzzling. Would love to hear if anyone has found any personal stories or any other information about all of this. DParks, Hebridean Chindit, Recce_Mitch and 5 others like this. jimbop and PackRat like this. Great video, thanks for the heads up. Photo from that newspaper cutting . That one Clive posted is cropped from this one. Wonderful video. Thanks for putting it up on here PackRat.